It has been quiet around Art at heart for the last six months or so. Not because I stopped attending events and exhibitions, but because Art at heart had an identity crisis. For three years, I posted sporadically on the most interesting events I attended in Rotterdam and a few other places. Then one day I started wondering why. The initial inspiration for the blog came with a nationwide protest against cuts to the arts in November 2010 (here), but for the spectator and sometime participant, the Dutch art scene has not changed much despite the cuts and Rotterdam remains as vibrant as ever. 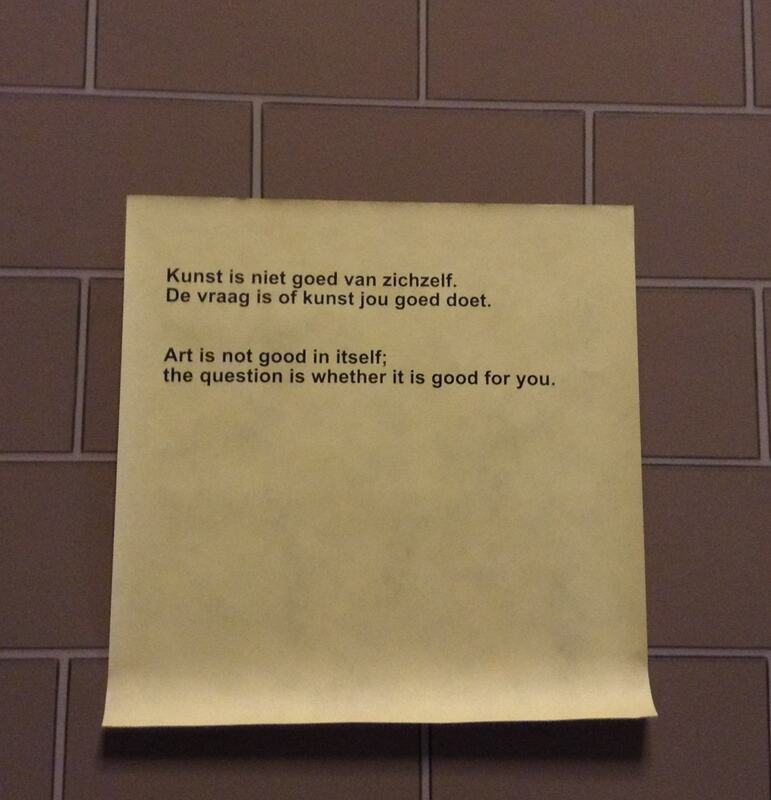 I’m not exactly an art critic and most people who read this blog are not even in Rotterdam, so they will hardly look to me for a guide on where to go and what to do. Sharing with my friends and family, who are spread all over the world, made sense, but other than that, what was I actually doing? So, I decided to let things rest for a while until they sorted themselves out. Often, I find this is the best approach to anything that doesn’t require an ambulance. The answer came in the somewhat unlikely guise of Alain de Botton. He is a writer and philosopher with a string of successful books, and he frequently pops up on the BBC. I am not a fan of talking-head programmes and beyond wondering if he is philosopher enough to deal sensibly with an acutely receding hairline, I had not paid him much attention. Then, a week or two ago, I finally made a long postponed trip to Amsterdam (all of 45 minutes on the train!) to visit the newly renovated Rijksmuseum. Once there, I noticed a slightly different tour of works in the museum, Art as Therapy by Alain de Botton and John Armstrong. As the museum is huge and I had cunningly timed my visit for the late afternoon to avoid the queues, if not the crowds, I decided to trail Mr. de Botton around the museum to give the visit some structure during the 90 minutes or so until closing time. I found an honest take on the reality of visiting the Rijksmuseum (the queues! the crowds!) and a refreshing attempt to relate the works to the messy thing that is life. Following the audio tour around the museum, you’re confronted with comments printed in plain type on yellow posters. Like this one, stuck on an anonymous wall in a stairwell. Isn’t that what it’s all about? Art is important to me because it is good for me. Simple as that. You don’t actually have to visit the museum to experience this tour. There’s a website and there’s an app, here. Of course, it is not the same as seeing the works in the flesh, so to speak, but you might still enjoy it, and perhaps it will inspire a visit to the Rijksmuseum. I plan to go again very soon to have a closer look at their collection of Asian art. I promise to share. Having gone to see the Madonna del Parto by Piero della Francesca near Arezzo this weekend – I can confirm that art is good for you. Just look at her face. What do you see there? You can spend hours speculating and that means empathizing. We should all do more of that and we might not be in the mess we are in.